Hello, everyone! This week I read two awesome books both by authors I absolutely love. I've gotten a ton of reading done recently that I am so excited to share with everyone. 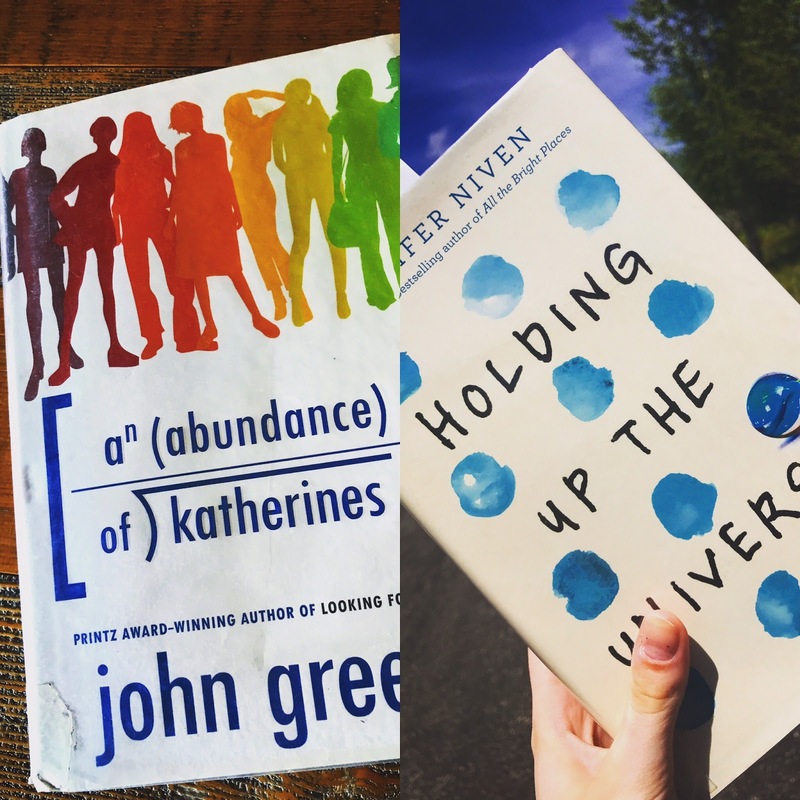 In the coming weeks, expect to see a few more articles featuring John Green books, though I promise not to inundate you. He really is a quality author which was why I was so excited to discover that he has a new book coming out October 10 called Turtles All The Way Down which I can't wait to get my hands on. I also wanted to spotlight his amazing website johngreenbooks.com which features the most detailed Q&A section I've ever seen for each of his books. In regards to Jennifer Niven, our other wonderful author this week, check out her other book All The Bright Places (My all time favorite book) and her author website as well as the online literary magazine she started (germmagazine.com and http://www.jenniferniven.com). Characters: 4.5 I thought that Libby and Jack were quality characters with layers and complexity. The supporting cast also carried their weight throughout the novel. Libby wants to show the world how to be kind and make a difference toward positive change after years of enduring hate. Her bubbly, energetic personality has come back to her again, and she is determined to never let it falter. She is so sure in her skin that nothing can really touch her anymore. Jack, on the other hand, has the appearance of being self assured and smooth, but it's really only a mix of natural swagger and survival skills as he walks through life unable to place people in his memory. He does a good job of trying to mask it while he deals with the other crumbling parts of his life (his little brother being the constant bullying target, his father overcoming cancer only to cheat on his mother, and his parents eminent separation). And he does his best all the time though no one notices or praises his for it because all they see are the mistakes that are totally out of Jack's control. Plot: 5 The plot is where this book shines. I couldn't stop turning the pages making every time I sat down to read a few pages into an hour long session. Niven knows how to keep the reader engaged and ready to devour whatever lies ahead. Writing: 5 Niven is most definitely doing what she was born to do. She has an undeniable talent that makes any book she pens special. Her quick chapters kept me engaged and never made me feel burdened by long bouts of reading. The words on the pages feel light and easy to read in the best way. This story is defiantly lighter and more hopeful than All The Brightest Places. It is a quality read that should make any YA lovers TBR list. It simply didn't make the five star mark because I didn't connect or identify with these characters as I did Finch and Violet; though I see that as a positive thing for two reasons. First, it means that Jennifer did something very different with a book in the same genre and format as her last one which show artistic verity and capability and guarantees each of her books will be unique. Second, I know that there are defiantly people out there who will identify strongly with Libby and Jack just as I did Finch and Violet, and that is very important. Characters: 5 I loved the characters in this book as well as how fully explored the cast is. The main character, Colin, has an identity crisis on his hands. Always having one label his whole life and living with the fear that he can't live up to it or continue to hold it is a facet of his personality I identified with. Colin's growth comes in stepping outside of his bubble and delving into the deeper parts of his personality beyond the obvious, and he needs a setting and people so far from the norm to do that. He has to figure out what he actually likes beyond what the world told him he is. Hassan has always shied away from commitment. He's been fine with letting his parents take care of him. At the start of the book he has no ambition to go to college or do much of anything with his life aside from sitting on the couch and watching Judge Judy all day. Working and living in Gunshot for the summer also pushes Hassan out of his little bubble as well. Some of Colin's intense want to matter starts to rub off on him in a positive way allowing Hassan to start taking the first tentative steps toward maturity. Then there is Lindsey, daughter of the town factory owner, seemingly beloved by all. Lindsey went from ugly and picked on to unique and uncaring, and then, in high school, she finally succumbed to the need to be liked, to be popular. Nothing Lindsey does is because she enjoys it. None of her personalities are real. She knows how to play the game to be liked by whoever she's with, and she puts on those faces accordingly. Colin and Hassan are her catalysts for returning to that point of honesty with herself. Plot: 4.5 I thought that it was a great story that served the plot. The elements of the story matched what was necessary for character growth.The story was entertaining and kept me turning the pages. Writing: 5 I always love John Green's writing probably because his narrators are always so amazing. This book is written in third person, a trait which often bugs me when reading books. That is not the case here. I believe that is because the narrator has a voice of his own that really comes through in a way that expertly sets the tone and works to make the book so much better. Now if the character development wasn't there, this would irritate me, but each and every main character is so well developed this narrator felt like the icing on the cake. Also, this book contains a sprinkling of footnotes (something I recently encountered in another book I read, thought the execution here is far better). They always made me laugh out loud and were never confusing to the actual story. It's no wonder John Green is such a popular author. I have always found his writing to be solid, never imposing, and always enjoyable.